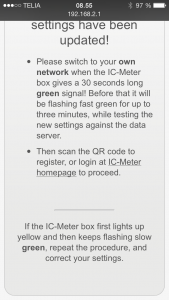 You can choose to connect the IC-Meter box to the Internet via cable (Ethernet) or via wireless network (WiFi). The easiest way to connect the box to the Internet is via cable. In this case, you simply connect the Ethernet plug into the backside of the box next to the plug for power supply. Please note, that if you use Explorer as your browser it must be Explorer version 10. And in case you have an Android phone, please note, that all Android versions can be used to view data, but Android do not provide support for ad hoc networks and therefore can not be used in the connection process. IMPORTANT: The Ethernet plug should be connected to the box before the power is turned on. The installation has succeeded, and the box starts to send meter data to the server. Proceed to step 2: Create a user. If your IT department only allows registered devices to communicate on the network, you should give them the MAC address of the box, see the batch on the back of the box. 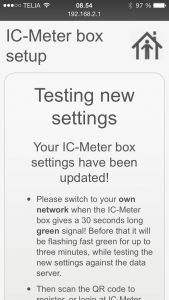 When the IC-Meter box is registered by your IT department, it will be able to communicate via the network. To restart, turn on and off the power and the installation procedure would start again. When the green LEDs lights for some 30 seconds and then turn on, the box is connected to the server and you can proceed to step 2. 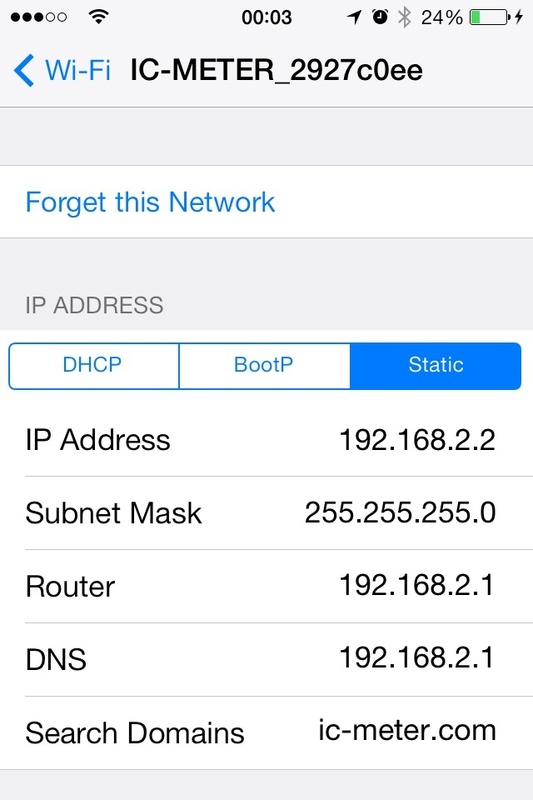 If you have a local WiFi net at home or at work you can use this. The advantage is that you do not need to draw a net cable to the IC-Meter box. If you use Explorer as your browser it must be Explorer version 10 or above. Android Phones do not provide support for ad hoc networks, therefore, they can not be used in the connection process. Currently Windows 8.1 and newer versions can not be used to the IC-Meter connection process, as wireless adhoc networks are not directly supported. There is an issue in Windows 8.1, where wireless adhoc networks are not showing up in the wireless network list in Windows 8.1. Currently we have not found a work around for this issue. See the following link. 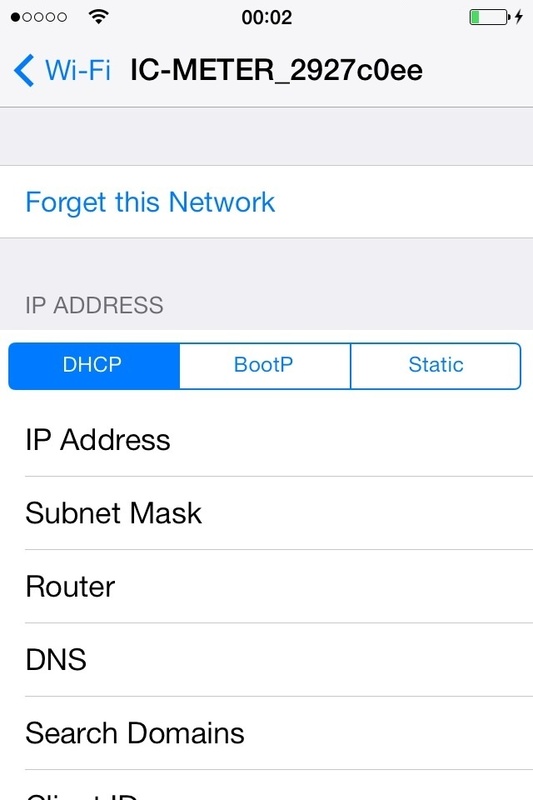 The WiFi connection is convenient if the password of the router is not changed too often. E.g. it is no good idea to connect the IC-Meter box to a guest network where the password is changed every day. 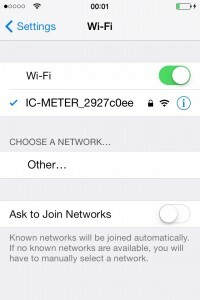 Your assignment, by connecting the IC-Meter box to the WiFi net, is to inform the box which WiFi net it should use and to register the password of the network. 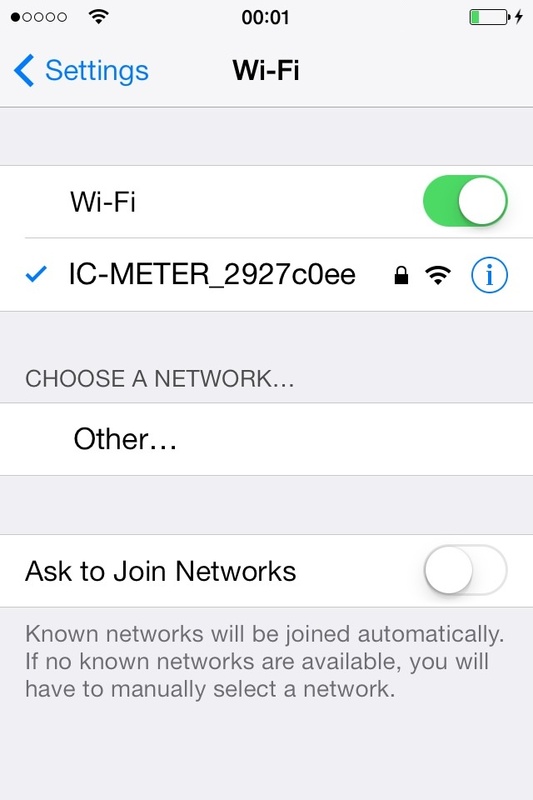 Please note, that the IC-Meter cannot be installed on WiFi net where the name (SSID) contains more than 32 characters. the green LED flashes slowly, meaning that the box has established an ad hoc WiFi net for the installation process. You can use your PC, MAC or an iPhone/iPad as keyboard. During the connection process the IC-Meter box works as a temporary WiFi access point. If you have an Android phone, please note, that all Android versions can be used to view data, but if you wish to use your Android phone for the connection process, it must be version 4.2. This is due to the fact that the previous versions do not support ad hoc networks. 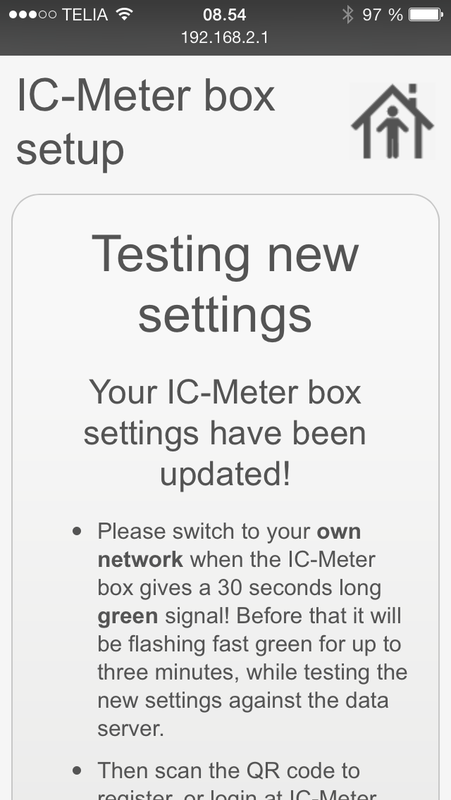 Wait for the check mark indicating that your iPhone/iPad/PC/Mac has been connected to the ad hoc WiFi network of the IC-Meter device. Now, your PC/Mac/iPhone/iPad is connected to the temporary WiFi net of the box. Next step is to choose your local WiFi net that the box should use for the future. Wait for one minute and then open your browser. You should write 192.168.2.1 in the browser and push ’Enter’ (this goes for iPhone, iPad, Android, Linux, Mac and for your PC). The browser now shows a welcome page where all WiFi networks are displayed. Choose the local network that the box should be connected to. Enter the password and click the ‘Submit’ button. 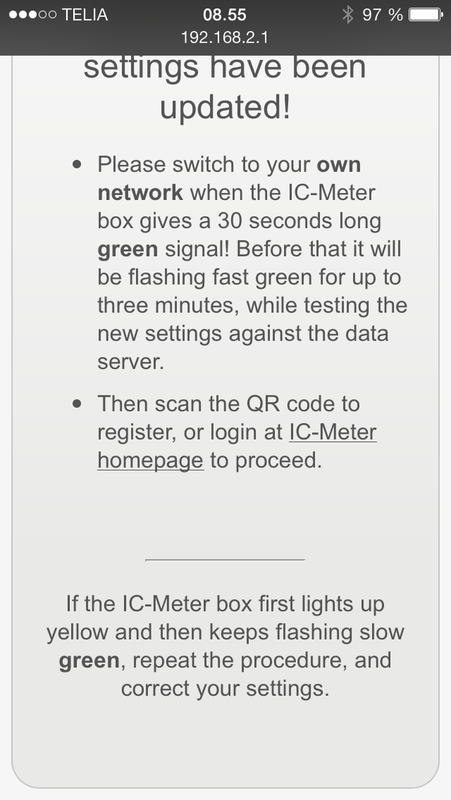 The LEDs on the box will now give some quick, green flashes for up to 3 minutes as shown below, while the connection to the server is being checked. When the connection is succeeded, the green LED lights steady for some 30 seconds, and then it switches off. When the green LED switches off the WiFi connection has succeeded and the box has now begun to send data to the server. This means, at the same time, that the box has switched off its ad hoc network and that it is now using the local WiFi net for the upload of data to the IC-Meter server. 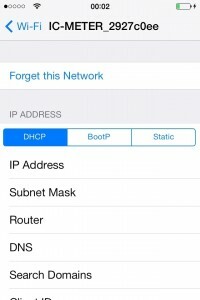 Wish to change location and change to/from WiFi-Ethernet? If you should afterwards wish to change the connection from cable to WiFi or the other way around you need to reset the settings. This is done by putting a paper clip into the little whole in the top of the IC-Meter box. The box should be switched on meanwhile you keep the clip down for some 5 seconds. Switch off the power for some 15 seconds. Insert a paper clip approx. 1 cm. into the hole situated on the top of the box and keep the clip down. Then turn on the power while keeping the clip pressed down. Wait until the LED start to flash green slowly. This may take up to 2 minutes. Now the box is reset, and could be connected to a new Ethernet- or WiFi-connection.